Used to be (العلوم السياسية في الشرق الأوسط - Political Science in the Middle East); shifted focus for the time being. 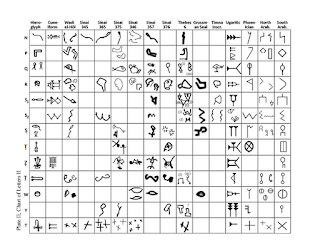 Ancient Semitic paleography, orthography, epigraphy. Maybe the occasional rant. I removed the previous versions of this paper because of a somewhat more specific approach I've taken (largely on philological grounds) over the past few weeks. I will shortly post the paper in full. I will also fix the presence of spell-check on the Wadi plates. 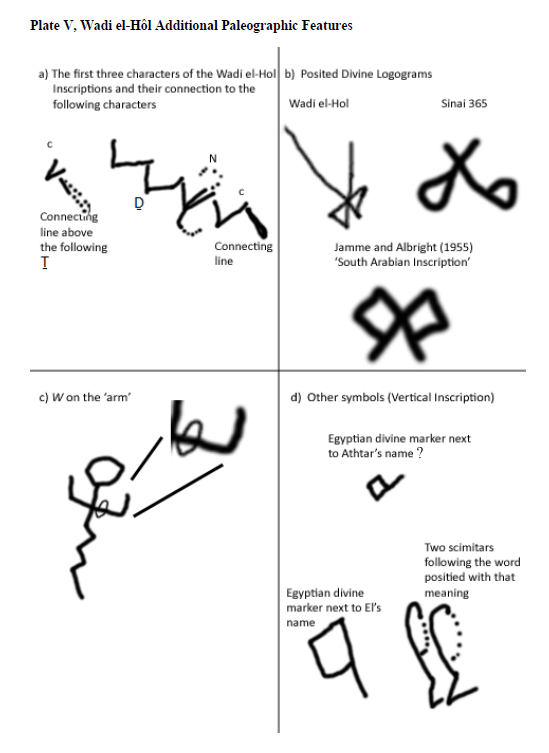 The primary distinctions (in the broader paper) result to an earlier structural sibilant/fricative usage present at Wadi el-Hol and in later Arabian script systems (but latent elsewhere), and the reinterpretation of a single character in Thebes 6, but the reinterpretation of dialect relations in some of the inscriptions as well. With regards to Wadi el-Hol, my working hypothesis is currently that the dialect is closely related to Amorite. This actually explains the structural sibilant confusion, directly reversed in Ugaritic; and the fricative (H) confusion is probably the result of a relatively early process of pharyngealization of H (although it is possible that there was a de-emphasis or glottalization of the pharyngeal). 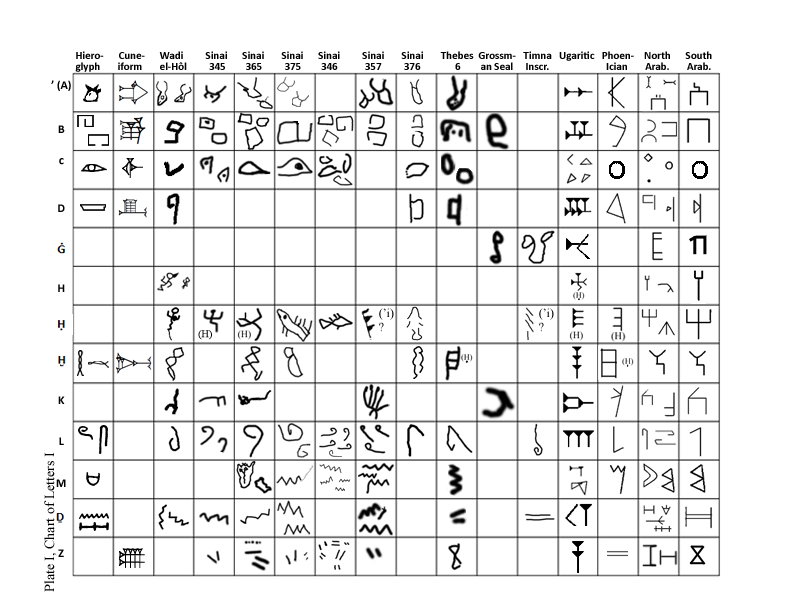 In terms of graphemes, Ugaritic preserves all three 'H graphemes,' but reversed the usage of the pharyngeal and glottal. Little regarding the translation or proper interpretation of Wadi el-Hol has changed. I can now explain, however, why 'to intoxicate,' as a D-stem, lacks an explicit medial W. I have also included vocalization with respect to the Northwest Semitic (Amorite-related) interpretation of verbs some of whose forms are best explained with respect to Akkadian (regardless of inflection patterns - which would then be NW Semitic). 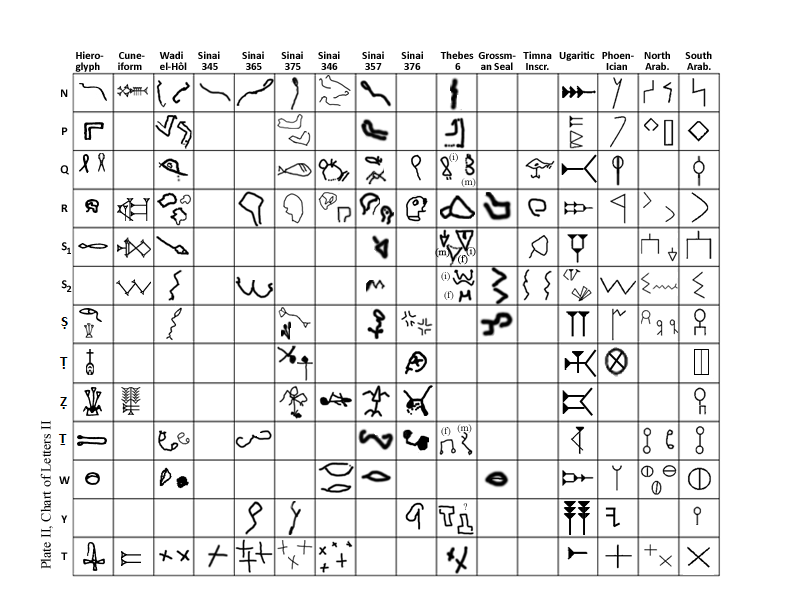 This identification, along with some Proto-Siniaitic inscriptions will likely help clarify the apparent paucity of non-Canaanite Northwest Semitic languages (other than Ugaritic) through their more common attestation in the 2nd millennium BC, particularly in early alphabetic texts. The first character in the Vertical Inscription (see, Plate III) appears (partly) with only three-peaks in the Horizontal Inscription (see, Plate IV). In the Vertical Inscription, these peaks are joined to a fourth, and the third is bisected. [iii] Upon closer examination, the third peak is actually bisected by an N, and the three-peaked character is Ḏ. The fourth peak is then actually c. A smaller, equally de-stylized wedge occurs above the following Ṯ, below which is a line; there is a line also below the first character group (see, also Plate Va). This then spells cṮTRH, the H possibly specifically being styled after Gardiner C10 – Ma’at. 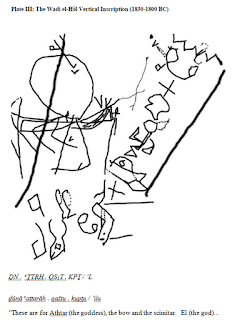 The next character is a Q flattened on its left side, followed by S1, and T. The inscription continues K, P, and Ṯ, and ends with ’, L.
The text thus begins with a 3rd person dual demonstrative, ḎN. In South Arabian ḏyn occupies this function,[iv] and a 3rd person dual demonstrative can be theoretically reconstructed in Akkadian as šunā. [v] The non-feminized divine name cṮTR might reflect similarity with Ištar, probably present in Amorite,[vi] whose name could also connote ‘goddess’ in Akkadian. [vii] Her name has also been traced to Proto-Semitic “*?aθtar- ‘morning/evening star’”. 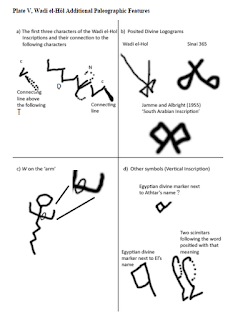 [viii] This is followed by an enclitic locative/directive –h, found in Biblical Hebrew and Ugaritic,[ix] and meaning ‘for Aṯtar/the goddess.’ This grammar also explains the physical connection of Aṯtar’s name to the demonstrative. The flattening of the left side of the Q may reflect it being styled as a “bow,” which is the word it begins QS1T (qaštu). [x] A bow is in fact drawn (partly cut off in photographs) to the left of the depicted figure in the Vertical Inscription. The next word, KPṮ may then be the staff to the right of that depicted figure. It is probable that the K occurs above the T so that QS1T is not misread ‘archer,’ but rather that both are read together. In Ugaritic, kpṯ occurs in an epithet to Anat. Juxtaposed with “the high heavens”, some have argued kpṯ means “earth”. [xi] It has also been linked with an Akkadian kub/pšu “headdress” and occurs among terms connoting authority. [xii] The root kbʃ may also mean “Amor … lamb, young sheep; Akk … =; Arab … ram; chef; ram, pillar, buttress; Mhr … lamb; Soq ram…”,[xiii] though kpṯ may have reflected a different, if parallel, root at this time. Indeed, the shape of the Egyptian xpS-scimitar has been described as the “foreleg of an ox”,[xiv] and Gardiner F23 (xpS) may also appear this way. The Egyptian xpS (scimitar) has been connected with Greek κόπις (kopesh) of similar meaning. [xv] The divine-royal object can now be connected with Anat’s Ugaritic epithet and this usage. The last word is ’L,[xvi] meaning god or Ilu. Hence, the first inscription (part) depicts a warrior-goddess, the second a powerful god who intoxicates her, placating her violence of spirit. Additional drawings, such as the bow and scimitar occur on both sides of the ‘figure’ drawn in the Vertical Inscription. The stylization of the Q as a bow probably corresponds with the depiction of two scimitars to the left of KPṮ (see, Plate Vd), bounding the two words ‘bow and scimitar’ with two pictures of those symbols. The Egyptian divine-determinative nṯr is certainly placed above Ilu’s name, and may unclearly be drawn next to Aṯtar’s name. The Horizontal Inscription also evidences a probable simplification of the cuneiform divine determinative. Hamilton speculated it may be a “subscript y?”. [xxxix] However, there are two comparable cases (see, Plate Vb): in Sinai 365, and likely in the ‘South Arabian’ Jamme 863 where Albright and Jamme suggested it was a monogram of ḎT. [xl] The Horizontal Inscription is also so far the only explicit evidence of an anthropomorphic origin for H. But not least of all, this is the first actual text found in a dialect apparently related to Amorite – though not all of the vocabulary is known through Amorite names. The doubling of the b's is indicated both by context and possibly by a very unusual, possibly somewhat unique dot in the middle of the 'b'. A similar dot occurs within the second c and both may suggest essentially consonantal reduplication. This is only plausible if the first line refers to a very common epithet (which it does), in which the construct state had lost its inflection, probably due to common (perhaps cross-dialect) usage. The epithet/title is thus in the simple nominative rather than in the genitive (through a construct state). Then, similarly, the second occurrence of 'the Mistress' must actually be treated as a D-stem verb meaning 'to wed'. The inscription is thus sort of bilingual, with the Egyptian actually being perhaps more ambiguous than the Semitic, and with the Semitic reflecting a mythological union between Set (most likely), The-One-of-Turquoise and The-Beloved-of-The-Mistress, and The-Mistress herself. Sinai 345 also appears to be unique in using an 'Egyptian viper' (f ) to render this phoneme (/f/). Sinai 345 also appears to evidence a monogrammed signature suggesting it was written by a scribe named Bin Surr, or more likely originates from a 'tribe of Surr,' quite possibly related to the city of Tyre. A 'tribe of Surr' (most likely, i.e. BN ṢR or Bani Ṣur), occurs in several inscriptions. [ii] Primarily, Darnell et al. 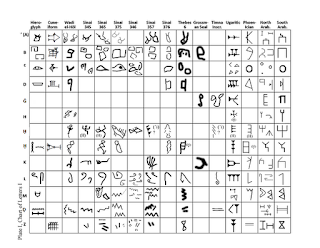 2005; Gordon J. Hamilton, The Origins of the West Semitic Alphabet in Egyptian Scripts, The Catholic Biblical Quarterly Monograph Series 40 (Washington, DC, 2006). [iii] See also, Hamilton 2006, 327. [iv] Norbert Nebes and Peter Stein, “Chapter 7: Ancient South Arabian,” in The Languages of Syria-Palestine and Arabia, ed. Roger D Woodard (Cambridge, MA, 2008), 154. 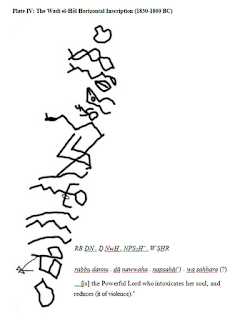 [v] See, Robert M. Whiting, Jr. “The Dual Personal Pronouns in Akkadian.” JNES 31, no. 4 (1972), accessed May 2, 2012, http://www.jstor.org/stable/543790. The presence of this feature may make this one of the most archaic attested Semitic dialects ever recorded, certainly the most archaic West Semitic dialect. [vi] Herbert Bardwell Huffmon. Amorite personal names in the Mari texts (Baltimore, MD, 1965), 107. [viii] John Huehnergard, “Appendix 1: Afro-Asiatic.” in The Languages of Syria-Palestine and Arabia, ed. Roger D. Woodard (Cambridge, MA, 2008), 243. [ix] Dennis Pardee, “Chapter 1: Ugaritic,” in The Languages of Syria-Palestine and Arabia, ed. Roger D. Woodard (Cambridge, MA, 2008), 26. [xiii] A. Murtonen, Volume 3, Sections Bb. Root System: Comparative Material and Discussions. Sections C, D and E: Numerals under 100, Pronouns and Particles, Hebrew Material, vol. 3 of Hebrew in its West Semitic Setting. A Comparative Survey of Non-Masoretic Hebrew Dialects and Traditions. Part 1. A Comparative Lexicon (Leiden, 1990), 227. [xvi] Darnell et al. 2005, 85. [xvii] Some authors of Darnell et al. (2005) repeatedly stressed to me that the inscriptions were far apart. However, Plate II (Darnell et al. 2005: 116) suggests they are at most two or three meters apart. [xviii] And for first causing me to seriously consider this possibility, I must thank Brian Colless. [xix] Could the suggested connection (below) to nocturnal drunken rituals suggest these were carved at night by torchlight? [xxi] CAD, R, 26, accessed April 30, 2012, http://oi.uchicago.edu/pdf/cad_r.pdf. [xxii] Cyrus H. Gordon, Ugaritic Textbook, Revised Reprint 1998, Volume 1 Part 2, Analetica Orientalia 38 (Rome, 1965), 75. [xxv] Michael C. A. Macdonald, “Chapter 6: Ancient North Arabian,” in The Languages of Syria-Palestine and Arabia, ed. Roger D Woodard (Cambridge, MA, 2008), 199. [xxvi] Nebes and Stein 2008, 162. 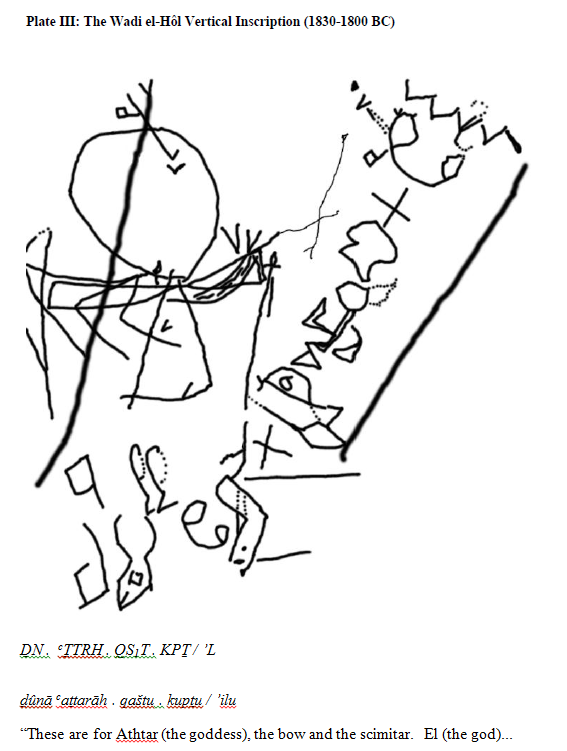 [xxix] John C. Darnell, “Volume 1: Gebel Tjauti Rock Inscriptions 1-45 and Wadi el-Ḥôl Rock Inscriptions 1-45.” UCIOP 119 (Chicago, 2002), 133. [xxxii] Herbert Bardwell Huffman, Amorite Personal Names in the Mari Texts: a structural and lexical study, (Baltimore, Maryland, 1965), 240 ("Na-ap-su[d]IM . . ."). [xxxiii] Interchange of Semitic ġ and Egyptian ḫ may not be unknown either (Wolf Leslau, “Semitic and Egyptian Comparisons.” JNES 21, no. 1 (1962): 48, accessed October 4, 2011, http://www.jstor.org/stable/543552). [xxxvii] In other words the borrowed verb’s structure would parallel Akkadian nâḫu ‘rest’ > nuḫḫu ‘appease’ (CAD, N, 143-50, accessed May 3, 2012, http://oi.uchicago.edu/pdf/cad_n1.pdf.). While tempting to simply identify this verb with the Akkadian, the Semitic orthography is wrong (Sem. nwḫ vs. nwḥ). 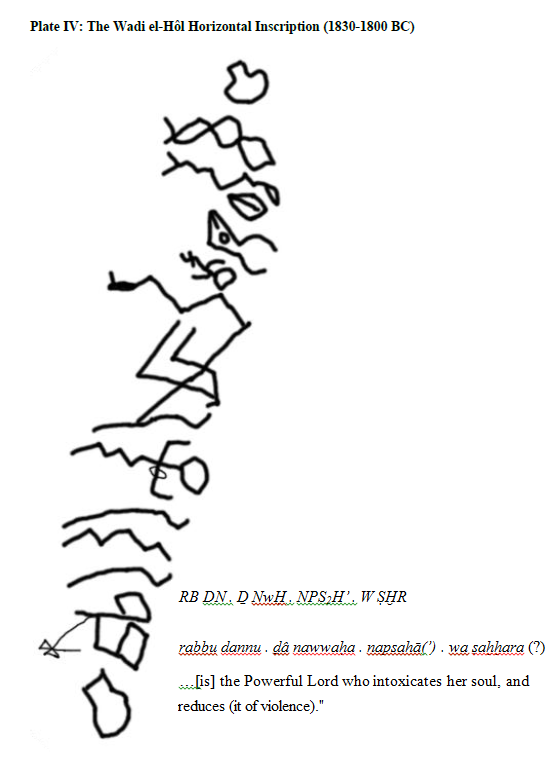 [xl] A. Jamme and W. F. Albright, “An Archaic South-Arabian Inscription in Vertical Columns,” BASOR 137 (1955): 34, accessed October 4, 2011, http://www.jstor.org/stable/1355555 . But based on their identifications (in Jamme 863) of the composite letters of the monogram, this hypothesis makes little sense. [xlii] Eric L. Altschuler, “Gloss of One of the Wadi el-Ḥôl Inscriptions,” Ancient Near Eastern Studies 39 (2002). [xliii] See, Darnell 2002, 195-204. I should probably note (and probably should have just fixed) that the character in Thebes 6 identified in Plate II as 'Y' is actually 'Ṭ.' All of these plates have slight problems and I'll fix them eventually. I was looking at the charts and there clearly have to be several revisions to accord with Wadi el-Hol more likely being from the 14th Century BCE. Since T_ is no longer evidenced before $, T_ must have essentially lacked an independent T_ after being transferred from the original affricated dialect to the Wadi dialect; so that is a probably Egyptian-influenced derivation at least by the 14th Century BCE. The entire D_ premise should be withdrawn. That leaves the Z premise on shakier ground (though unlike with D_, not the identifications). Because W at Sinai is arguably ambiguous (to my memory), that might still have a unified origin - with the more staff-like crescent W appearing in Canaanite later (around the same time the slitted moon appears at Wadi el-Hol), each outgrowths of an oblong shape with a stump-outgrowth.